As we enter the Top 3 finalists, we come to a card that divides opinion. On one hand, there’s the camp that says it’s auto-win. Then there are those who are like “it can be countered, you pussies”. Not that exact phrase but it’s a decent approximation. Well really, you fight this thing by spending the turns before it dropping the 0s and G Guardians this will seal of next turn. Regardless, the fact the sealing ability is a generic flip and therefore a great way to use up Sebreeze is basically why this is a staple at 4. What’s up, Rogue Squad?! 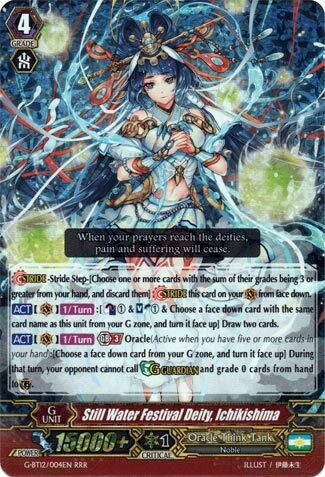 I remember at the beginning of the year and how almost everyone and their mama’s said that Oracle Think Tank was the worst clan in the game…well, I think they pissed off someone at Bushiroad because they released this god (figuratively and literally since it IS considered a deity). Still Water gives a free draw 2 for a Counterblast and Soulblast along with a Persona Flip, but the icing on the cake for this is that if you have five or more cards in your hand (and honestly, that’s not that hard for any OTT deck these days), then every attack on your board can’t be blocked by Grade 0’s OR G-Guardians. I’ll admit that’s I was hoping to see some kind of G Guardian restriction in the future, but I wasn’t expecting it to show up this quickly let alone that OTT would be the current exclusive holders of that kind of restriction, so kudos to whoever gave the idea to give this skill to them first as it made people weary about going against potentially four turns of not guarding with the best shield values in the game (note I said values meaning 10k, 15k, etc. Sentinels are still the best defense in the game IMO). Regardless of the build, you play four of these…there’s no debating that.